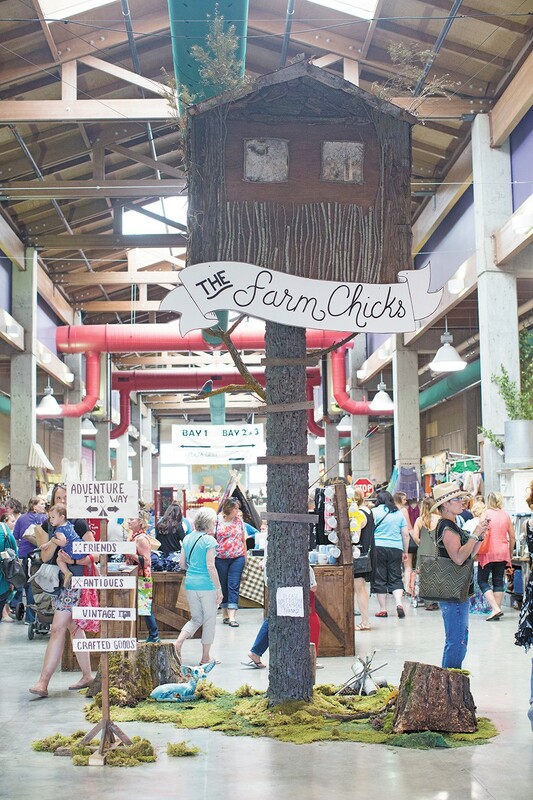 The Farm Chicks show now fills all available exhibit hall space — 90,000 square feet — at the Spokane fairgrounds. Hours before doors open, the line grows. Snaking hundreds of feet through the Spokane County fairgrounds parking lot, the mostly female crowd is ready; collapsible shopping carts, tote bags and wagons in tow. The early morning air buzzes with excited chatter as they sip from drive-through coffee cups while they wait. Making the pilgrimage from Canada, Oregon, Utah and beyond (some even via international flights), they're on a treasure hunt of epic proportions. The challenge before them: to scour hundreds of stalls filled to the brim with every sort of vintage and antique item one could imagine. There's repurposed furniture, retro kitchenware, vintage art and clothing, rustic farm equipment, industrial salvage pieces and, in general, old things galore. Many wait all year for Farm Chicks Show weekend — it's like Christmas in June. What began 14 years ago as a modest vintage and antique market in a barn has now grown to the second largest event of the year at the Fair & Expo Center, just behind the fair itself. The Farm Chicks Antique Show was started in 2002 by Serena Thompson, a creative homemaker and contributor to Country Living magazine who runs the business from her idyllic Green Bluff farmhouse. Fans agree that the show lives up to its tagline "the happiest antiques show on Earth." And early on, it caught national attention. "I fell in love with the show right away for several reasons," says Nancy Soriano, who served as Country Living editor-in-chief for 10 years and now is the New York-based editorial director for the lifestyle brand West Elm. Farm Chicks Show founder Serena Thompson. "One is that it had a great spirit," Soriano continues. 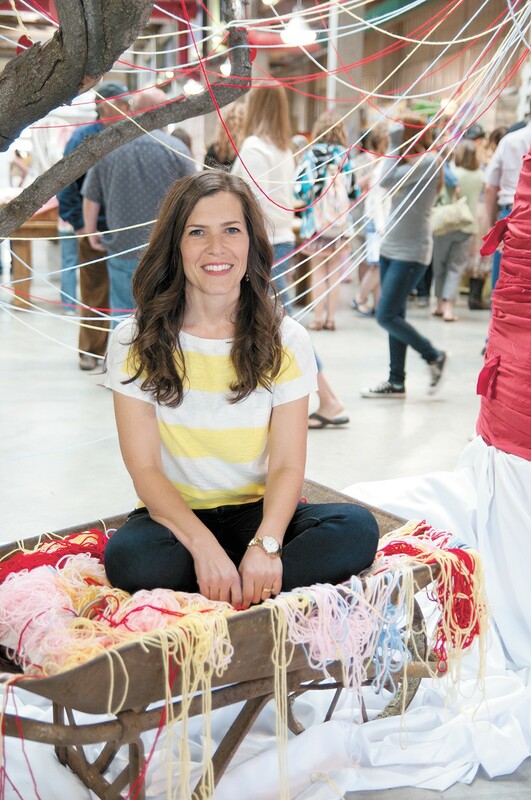 "Also, there was this great camaraderie of women, a lot of women who might have been collectors or stay-at-home moms and were just starting to launch a business, and this was an opportunity for them to be a part of a show. It was a great selection of vendors and product — a wonderful community, and Serena really added to that." Soriano wrote about the show for Country Living, and invited Thompson and her then-business partner, Teri Edwards, to become contributing editors to the lifestyle magazine. That major nod to the show, and toward the audience it directly catered to, undoubtedly helped propel Farm Chicks — and Spokane's still growing vintage and antique shopping scene — to where it is today. Attendance increases every year. Last year, more than 20,000 shoppers visited the show during its two-day run. Demand to become a vendor in the juried event is so high that spaces for next year will be full by July, or sooner. "Farm Chicks has a lot of people, that this is what they do for fun. It's not their main business, and it's something I really love about it," Thompson explains from her loft office above the barn-to-garage conversion that overlooks the green fields and orchards spreading across Green Bluff. "The show is huge, but it's really important to me that it's a lot of small businesses," she says. "I think that's something unique about it. For a lot of people, this is something they collect all year for." For this year's 14th annual Farm Chicks Show, Thompson expanded to the fourth and final bay of the fairgrounds main exhibit hall, filling all available indoor space at the venue. This weekend, more than 170 vendors will set up shop, many taking up multiple vendor stalls, across the 90,000-square-foot exhibit halls. In the weeks leading up to Farm Chicks, vendors at Boulevard Mercantile are feeling the hustle. On a Thursday afternoon, one of the shop's 10 vendor-space renters is "blowing up her space," and piles of old stuff are everywhere. Boulevard co-owner Joellen Jeffers laughs as she explains the phrase is shop-speak for when vendors need to add and refresh items in their ever-changing inventory of things for sale at the shop. When one piece sells, a new piece must rotate in. More than 20,000 people are expected to attend this year's Farm Chicks Show. Boulevard Mercantile opened in February 2015, joining the ranks of vintage, antique and thrift stores lining the blocks of North Monroe between downtown and Garland Avenue. Most of the sellers inside the historic, triangular building got their start at Farm Chicks, including Jeffers and her husband, David, who own the store with business partner Dan Webb. Two weeks before the show, they're out on a "picking" mission at a local, retired collector's home who's invited them to check out some pieces he may be willing to part with. Private collectors, estate and garage sales, and simply having local connections who know that Jeffers and Webb resell antique and vintage goods all help to keep their inventory fresh and full. Yet searching for items to resell as part of their curated inventory requires careful balance. The local collector offers Jeffers and Webb a box of paper hand fans from a now-defunct Spokane funeral home, inscribed with hymns on one side and a soft watercolor of Jesus and his faithful on the other. They're kitschy and nostalgic, but what would a buyer use them for? "That's what I have to think about," Jeffers says. "I'm like, 'I like that,' but who's my clientele? And I think about that wish list back at the store and go through that in my mind, because I don't want something sitting in the store forever." Webb, meanwhile, has recently returned from a three-week, cross-country trip to load up a truck and trailer with finds from the massive Brimfield Antique Show, founded in 1959 and now held three times annually in its Massachusetts town namesake. Many of the pieces he purchased there will be in his own Farm Chicks stall, under the name Storehouse Goods. Farm Chicks weekend means double duty for Boulevard Mercantile's owners and sellers, as they'll fill spaces on the show floor (doing about two month's worth of sales in just two days) while making sure the shop is filled with treasures of equal quality. With so many out-of-town shoppers here for the show weekend, brick-and-mortar vintage and antique retailers must prepare for an influx unlike any other time of the year. Boulevard will add extra hours on Saturday evening and Sunday, a day it's usually closed. In downtown Spokane, it's the same for the 18 sellers at Chosen Vintage (formerly Roost). "Farm Chicks throws a lot of business to us," says Jean Corder, who sells there under the shop name MagPye. "People load up at Farm Chicks, and then load up here. It's really impacted the thrifting and flea market scene drastically. [Spokane is] a destination for it now." Corder doesn't sell her vintage finds at Farm Chicks, yet says she always shows up as a shopper each year. 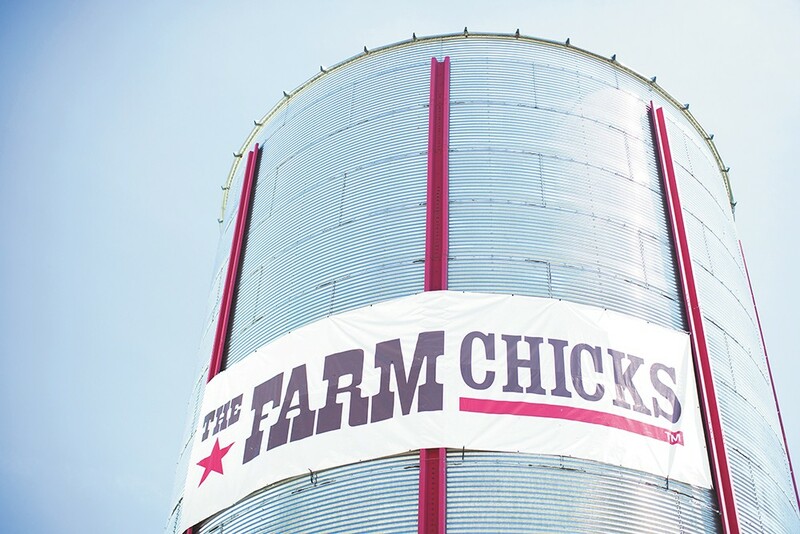 "Farm Chicks definitely exposed Spokane — and me — to the idea of just how big this can get," she adds. The market for vintage and antique goods has always existed, yet not quite on the same scale it's reached now. Whether influenced by do-it-yourself TV shows on HGTV, bloggers and lifestyle magazines, or events like Farm Chicks, decorating one's home with a combination of old and new has developed a mass appeal. "You might not have a lot of vintage, or maybe you dabble with it, but you can just put one great piece out and it adds so much warmth," show founder Thompson explains. "Everyone wants to feel a little special or have their own unique style, and I think that's what's fun about vintage. You can find special little things that no one else has," she continues. "There is real satisfaction in finding this great thing, this one thing you hunted down. You also have this memory of this special day where you went out and found these great things." Luckily for Spokane and those who travel here to shop at Farm Chicks and the local shops, our market for vintage and antique goods is still somewhat untapped. Prices aren't overinflated, which Thompson has seen in other parts of the country, like California, and often you're finding goods that have only passed through one or two owners. "Here, someone found it at a farm sale, and got it from the original owners," she notes. That plays well into the desire from shoppers to know the story behind these old objects they're bringing into their homes, pieces often built to last for generations.